A playful variety, from the Beatles to Gabrieli to Dixieland, and much more! 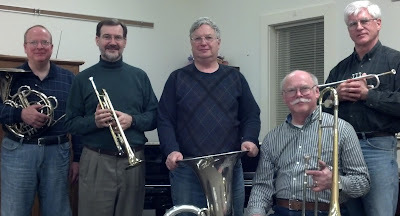 The Yellow Springs Brass! has been playing together for twelve years. Or maybe fifteen. They are aging and can’t remember. Bruce Heckman and Robert Love (trumpets), Dave Vrooman (trombone), Steve Vrooman (French Horn), and Hans Marlett (tuba) comprise the group. They don’t play for profit, but enjoy supporting worthy organizations, and have raised funds for Rwandan relief, the Riding Centre Association, the Yellow Springs Senior Center, the Yellow Springs Emergency Welfare Fund, St. Paul Church, and Catholic Social Services. They have played in churches in Yellow Springs and neighboring communities, in schools and extended care facilities, outdoors at Friends Care Community Ice Cream Socials and, most visibly, downtown on the street corner in December.